Mayweather vs McGregor in the UFC? Home > News > Mixed Martial Arts > Mayweather vs McGregor in the UFC? Floyd Mayweather (L), UFC President Dana White (C), Conor McGregor (R): the three biggest names in combat sports? Photo by Chris Farina (Zuma Press/Icon Sportswire). Floyd Mayweather is stating that he could possibly fight in the UFC in 2018. Is it a publicity stunt? What does Conor McGregor think about the idea? 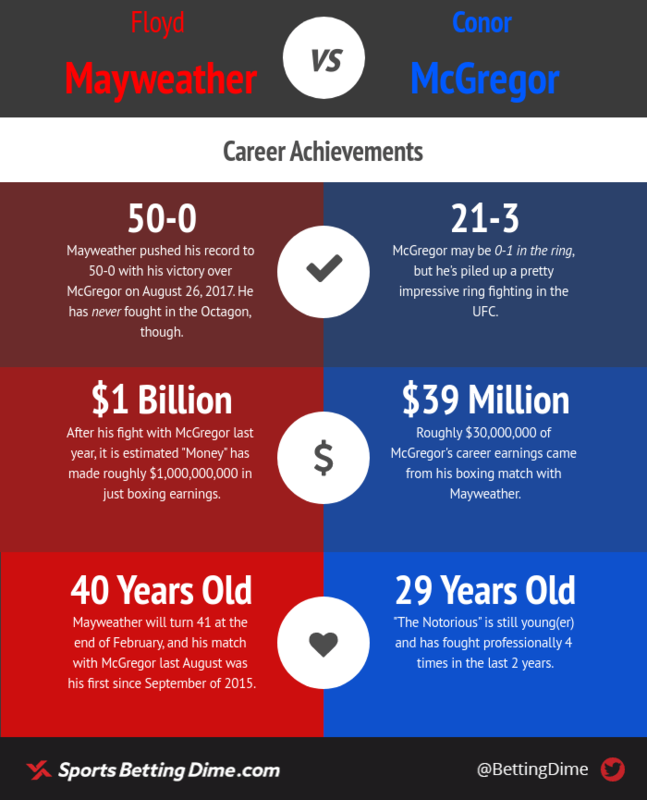 What are the odds another big-money fight between Mayweather and McGregor takes place inside a UFC octagon, and what are the chances Money actually wins? Is the very fact that we are talking about a potential UFC fight between Floyd Mayweather and Conor McGregor a sign that we are entering the end times? Is so, bring on the Apocalypse, because it’s bound to be entertaining and rife with betting opportunities. Floyd Mayweather Jr. has been releasing some cryptic videos about possibly stepping into a UFC octagon and it sent fans and media alike into a tizzy. Will it actually happen or is it nothing more than a PR stunt? *Additional propositions available upon request. “Money” Mayweather went 50-0 in his boxing career which included the “Money Fight” against UFC lightweight champion Conor McGregor last summer. During the press tour for that fight, Mayweather said he would “whoop” McGregor in the UFC. Afterwards, McGregor claimed Mayweather promised a second go-around in the octagon. 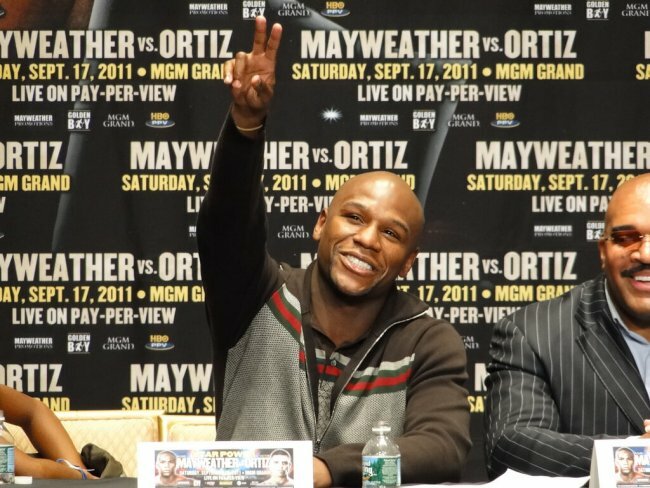 Floyd Mayweather during a press conference. Photo by Bryan Horowitz (Flickr) [CC license]. When UFC President Dana White was asked about it, he told ESPN that talks were indeed happening between the UFC and the Money Team. When Mayweather seemed to throw cold water on the idea, we chalked up the talk as two media-hungry personalities doing what they can to stay in the spotlight. But then news broke that negotiations are still happening between the UFC and the Mayweather and McGregor camps, and that a $400 million dollar fight is maybe, possibly in the works. Sound crazy? It is, in some respects. Anyone who knows anything about mixed martial arts knows that you don’t pick up the sport in a matter of months. As CM Punk will tell you, natural athleticism won’t get you very far. 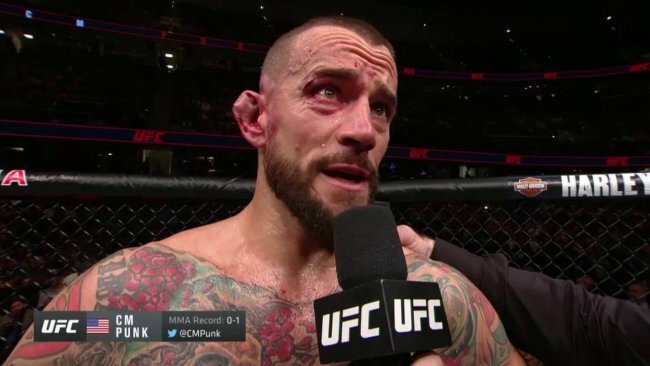 Phil Brooks (CM Punk) after his fight with Mickey Gall at UFC 203. Photo by UFC (YouTube). If it is just a viral advertising campaign for the online betting site, then mission accomplished; they racked up seven million views and caught the sports media, hook, line, and sinker. McGregor recently responded that if Mayweather’s videos were nothing more than quick promotional cash, it would stay with him forever. Let’s be honest. Mayweather has done a lot of things in his life that should bother him for the rest of his days and yet he doesn’t seem to care. Not getting into the cage would probably be the least of his regrets. McGregor has stated that he would do whatever he wanted to Mayweather if their rematch were to happen in the Octagon, and he’s right. The brash Irishman’s kicking game, alone, would be too much for the undefeated boxing champ to handle. So where does that leave the smart money when it comes to the line offered by Bovada, which has Mayweather making his MMA debut in 2018 at 5/1 (+500), and the odds of the whole thing being a promotional troll job at 1/9 (-900)? Given that we see the odds of Mayweather entering the UFC octagon in 2018 at 9/2 (+450), we’re inclined to bet on “YES.” As last summer’s improbable boxing match proved, it’s not wise to bet against two guys who stand to make ludicrous sums of money doing what they love.